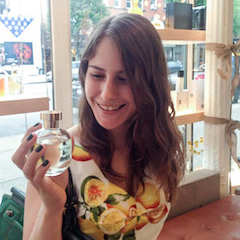 A salesman literally flung four Memoire Liquide samples at me as I attempted to flee the terrifying Lexington Ave Bloomingdale’s fragrance department about a year ago. 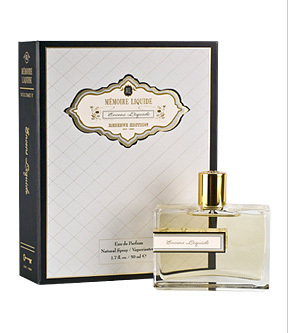 I had never heard of Memoire Liquide, and apparently neither has anyone else; their perfumes have 3 reviews or less on Makeup Alley. Well, I’m thankful for that salesman’s enthusiasm/desperation, because this is some good stuff! Encens Liquide is an incredibly smooth, lemony incense fragrance, with the same gorgeous amber note that defined the original Prada perfume. It is quite sweet, which an informed source tells me makes it unlikely to trigger Mass memories for the lapsed Catholics among us. There’s not much in the way of evolution/development here, but it sure smells great. I’m excited to try more of this line. New York department stores (outside of Bergdorf’s, which is a lovely oasis) are seriously traumatizing. If you weren’t claustrophobic before you went in, you are now! In fact, they are! (Allegedly!) ML was founded in 1984, Aftelier in 1999. I have to say I don’t care for either bottle! For those prices, it better look pretty on my dresser, too. I’ve always disliked that about the Malles, as well. That is super weird! It’s by the same director, and in the same style as, “Little Miss Sunshine”, so if you were a fan of that, I’m sure you’ll like this too. Let me know what you think of it! Loved it! I haven’t seen “Little Miss Sunshine” so I will look for that one too. I actually prefer Sunshine Cleaning because, although it’s obviously not a chick flick or anything, it focuses more on the female experience. Little Miss Sunshine has a broader focus, dysfunctional families, but it’s also a very good movie.